Having recently been to a music festival, this situation is fresh in my mind. Using a portaloo is one of my biggest fears and one of the reasons I rarely do weekend festivals. The dark, dingy box which is too small to manoeuvre without touching edges that shouldn’t be touched. Too dark to be sure whether the liquid substance you brushed against was ‘water’ – undoubtedly not but I try not to think about it. well anyway… it made me draw this picture. This entry was posted in Events, General, Life and tagged art, cartoon, doodle, festival, humour by bighair63. Bookmark the permalink. 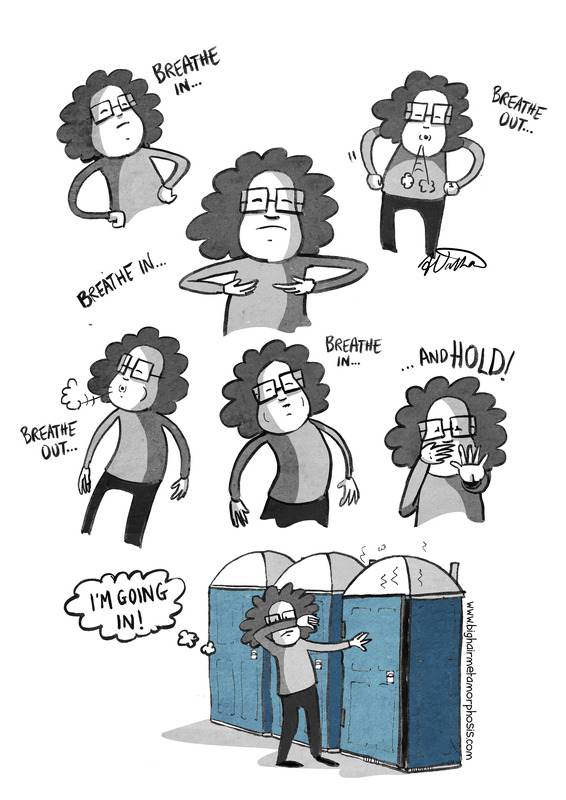 This is my experience with most public toilets. And alas I have been blessed with a very small bladder. So I rarely make it home having not engaged public toilets. The struggle is real! Oh yeah, those porta potties are the absolute worse. Evil … Pure evil they are. I feel your pain. This issue has also influenced my attitude towards many outdoor activities.